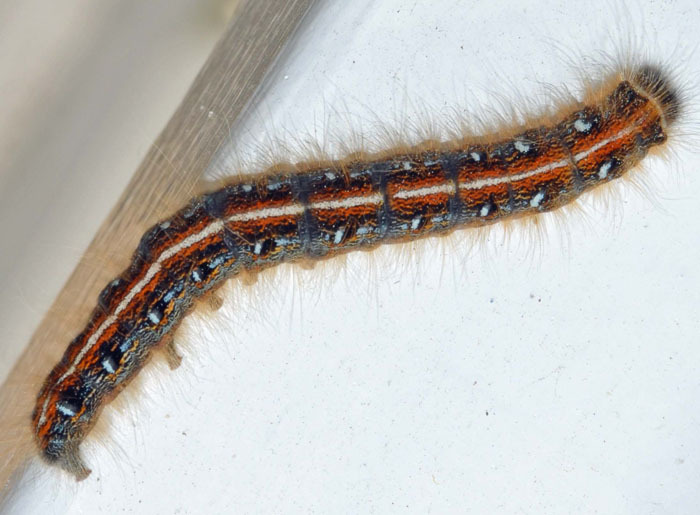 (Eastern Tent Caterpillar) - imm. Size: approx. 55 mm. Photo: 03/17/15, 2 pm. The Eastern Tent Caterpillar has a solid cream/white line along the dorsum (middle of the back). Its sides are marked with blue, black, orange and white whereas the face is dark. They are among the earliest caterpillars to appear in spring and this one was the first in my yard this year. Eastern Tent Caterpillars secrete silk wherever they go and other caterpillars follow and enhance those silk trails. The trails contain a pheromone (see second link for more information). 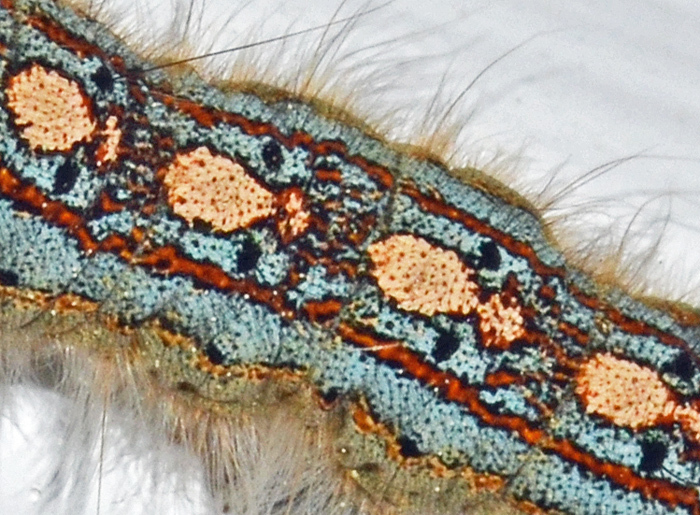 (Forest Tent Caterpillar) - imm. Size: approx. 50 mm. Photo: 04/09/16, 4 pm. Awesome colors and patterns. Forest Tent Caterpillars create silken mats on tree trunks and large branches where they congregate to molt or rest. The larvae also deposit silk in strands along which they travel to and from feeding sites; a very small version of the silk road so to speak. 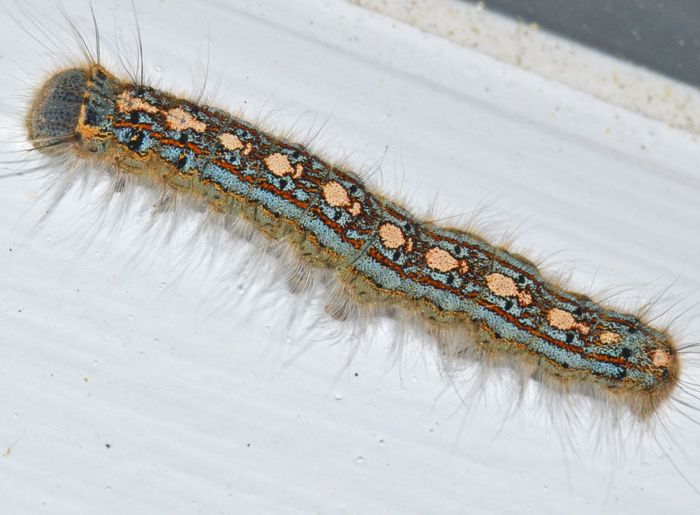 Unlike the Eastern Tent Caterpillar, these little fellows do not form silken tents. Click on the small photo to see a close-up of the same specimen. I was excited to finally see the moth that goes with the interesting and colorful caterpillars of this species. 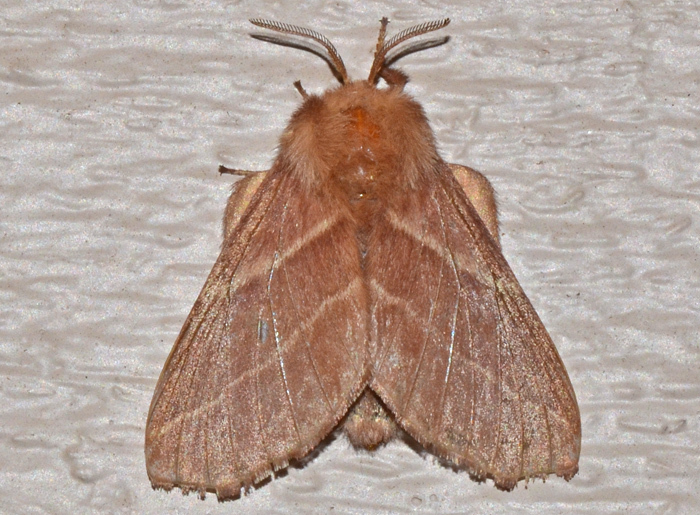 The chunky moth was attracted to our porch lights and had the habit of fluttering its wings while resting.